9 ft. 11 in. x 5 ft. 10 1/2 in. x 7 ft. 5 in. 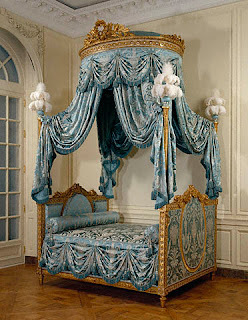 A grand Louis XVI bed like this one was meant to stand in a deep niche in the bedroom of the main apartment of a palace or mansion. In the 1700s, visitors were frequently received in the bedroom, while the host or hostess was still in bed or at his or her dressing table. Wealthy Europeans of this era spent vast sums of money on lavish textiles to decorate their rooms. Although the extravagant upholstery, passementerie, and hangings on this bed are modern, they replicate its original grandeur. To match the effect of other contemporary beds, curators and conservators studied photographs of this bed taken in the early 1900s, when much of the original fabric remained.